The ReactOS Project is pleased to announce the release of version 0.4.9, the latest in our accelerated cadence targeting a release every three months. improvements such as greater system stability and general consistency. most modern build systems will attempt to spawn multiple compilation processes to speed up the build process. In the past, ReactOS was actually capable of self-hosting, but this capability came with significant caveats, with the biggest being this was achieved in a much older version of the ReactOS kernel. Since the reworking of the kernel into a more NT-compliant design and implementation, various gaps in functionality that remained to be completed rendered ReactOS unable to build itself again. 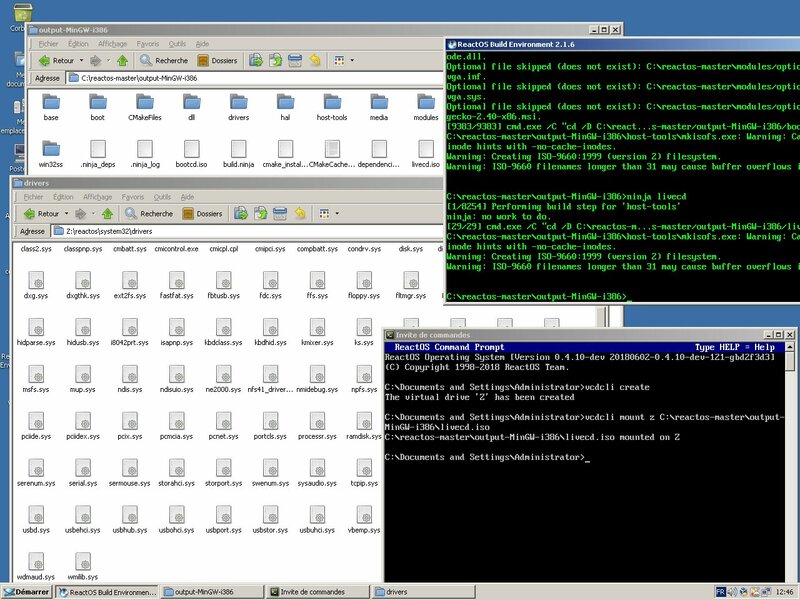 After many years of hard effort, including the most recent batch of filesystem related changes done by Pierre Schweitzer, ReactOS is once more able to self-host. And in the spirit of open source, it was the FreeBSD project’s implementation of qsort that helped Pierre bridge some of the last pieces needed to achieve this. layer (HAL), and the FastFAT driver. The biggest culprit in the instability came from the significant resource leakages caused by the FastFAT driver, resulting in it eating up the common cache to the point where attempts to copy large files would result in a crash. To rectify this problem, Thomas Faber and Pierre worked together to correct the FastFAT driver’s behavior, adding in write throttling support and restraining its usage of the cache. While a more conservative usage of the cache might see the system behave a bit more slowly during IO operations, it ensures that resources remain available to service for large IO operations instead of crashing like before. takes, and Joachim should be applauded for his dedication and perseverance in ensuring 0.4.9 would be the best release to date. Several quality of life improvements have come to the shell, the first of which is a built in zipfldr (Zip Folder) extension by Mark Jansen. accomplish it. And as the gif below demonstrates, ReactOS’ implementation is indeed very zippy. working on, along with plenty of other improvements to the shell. 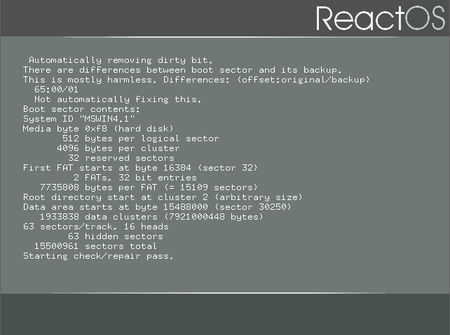 been so integral in making the current ReactOS shell behave and function in ways users are long used to from Windows. There are of course plenty of other changes in less trodden parts of ReactOS, with many people providing contributions and improvements. bottles of beer for taking on that one). appropriate that its unicode support be a priority, something that Alexander Shaposhnikov has lent his hand to. itself proved useful in a rather unconventional manner when it was demonstrated to help reduce the loading time of the game Globulation 2.
from such devices. We’re not there yet, but we’re getting closer with every release. sincere thanks to everyone that has taken an interest in helping improve the project, and we look forward to meeting even more of you in the future. Khaldi has synced many user mode DLLs to WINE Staging version 3.3. Really impressive achievement - a release of ReactOS is always incredibly heartening news. I am in awe of all the contributions of such talented people. * Common Cache and FAT32 fixes. One of the biggest issues was instability while copying large files. 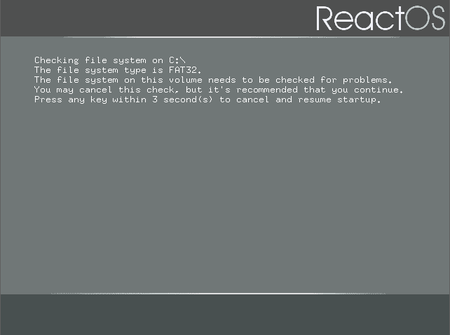 Now you can install larger applications, I think, games and... wait, find another bug to crash ReactOS! This is an advancement, actually! Also, we are progressing on repairing corrupt volumes, which is another issue ReactOS suffers for a long time, and hopefully registry. Another step for stability. Making ReactOS self-hosting is another bonus. * Transaction Translator support. It was a major hole for ReactOS causing many boot crashes with USB enabled. Hopefully, with new USB stack in the future, ReactOS will be far ahead than Windows 98. *Application compatibility. Silently, most apisets have been added, some releases later, ReactOS will shine more. There's a new video demonstrating new features of ReactOS (Good job!) and giving a link of 0.4.9 Community Changelog. I'm very happy that our once-unnoticed changelogs got acknowledged, advertised and doing its job: showing users that ReactOS is progressing nicely! Amazing release as usual, congratulations to ReactOS team for another successful release! LiveUSB work just isn't merged in yet. Such undertaking must be very carefully reviewed before even risking it. As for networking, there is work being done for a few more drivers, specifically Intel e1000 which should target VMWare's network adapter. If you mean making it overall more stable, then I'm unsure if there is anything being done in that direction. I mean, ReactOS' current usb stack only recognizes usb 1.1 devices (my verbatim 256mb pen drive from 2006 is fully functional) but 2.0 are totally ignored by the system (my Imation 8GB pen drive from 2014 don't work). Maybe the compatibility for wired networking is mostly stable and functional, but in wireless there is almost none card working, and if we add usb to the recipe the chances of success are very very low, for example, installing a simple DLINK DWA-123 wifi usb adapter is completely impossible right now, while even on linux there is some chances to successs. Mainly because USB is a very sensitive subject amongst developers and providing a fully working USB stack component is not all that easy as you may have thought. Vadim Galyant has done a lot of work regarding USB however much of his work must be reviewed by developers in an appropriate and careful matter for potential magical constructs, bugs and things that could go against ReactOS' legality. So far Thomas Faber has mainly reviewed the parts of USB yet there's still much work to do. USB is a huge feat on itself. As for the release, as usual I'm very excited to see progress and effort by developers and contributors alike! You guys are awesome! Zipfldr was an interface to a third party library on Windows. We can support more formats and add a Windows-style API, because we implemented it from scratch and are not bound by the license terms which constrain Microsoft. Odd, my 8 and 16 gigabyte flash drives are recognized as normal on my test machine. I use them regularly to move over installers and the like to test as the networking card and wifi drivers are not functional as of yet. I really liked this. If you continue that kind of videos, it'll be a really nice bonus for ReactOS. You can concentrate on visual things, stability improvements and fixed programs. Share experiences with the new ReactOS 0.4.9 release in the General Discussion and Feedback forum. Many posts here are becoming off-topic to the announcement that ReactOS 0.4.9 is now released. I also follow this project over 8 years, and i must say there was done a lot in 8 years. Let's wait and see and be patient. Give developers may be another 8 years - and the version will be higher than 0.5 perhaps 0.9 or even 1.0 ! I am convinced that at some time 90% Windows compatibility will be achieved, and then the mass of user will use it ! It will be clear that this or that programm doesn't still work, but it will be an "extra challenge" for a certain group to make these programmes run. So the percentage will over the years move and move from 90% to 95% and farther and farther. In my dreams there is in future a counter of percentage of compatiblity on ROS Website. This will ran farther and farther over the years it will be 99% and then there will be a list of single programms that don't still run or work correct. Commmunity will dart at the list and one day every programm will run ! Can this release run on real hardware?